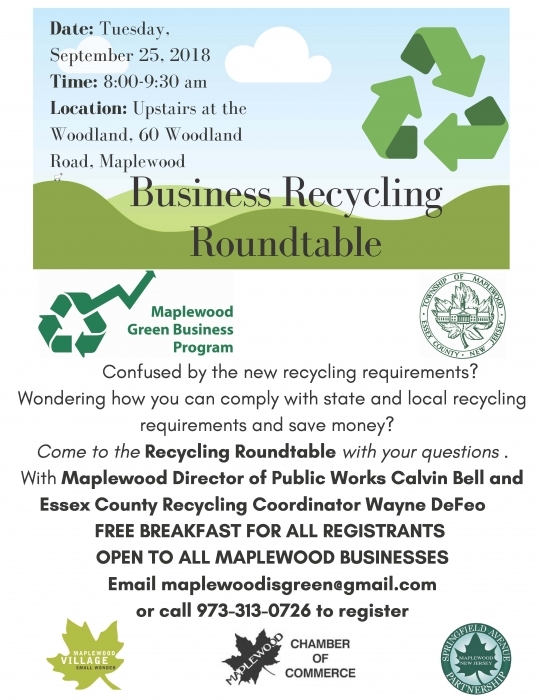 Maplewood is hosting a Business Recycling Roundtable for local businesses. Recycling requirements have become much more stringent this year due to the “National Sword” policy in China which restricts the types and quality of recyclable materials that it will accept for processing. This affects us here in New Jersey (and all over the country) because our recyclable materials were previously sent to China and many are now refused. Maplewood Director of Public Works Calvin Bell and Essex County Recycling Coordinator Wayne DeFeo will discuss these changes and other challenges at the roundtable. Come with your questions so you can figure out how to comply with the recycling law and improve your business practices.